Weaning is the gradual process of introducing a baby to solid food while cutting back on milk feeds. When your tot no longer receives any breast milk or formula, they’re considered fully weaned. The American Academy of Pediatrics (AAP) recommends exclusive breastfeeding for the first six months of a child’s life. 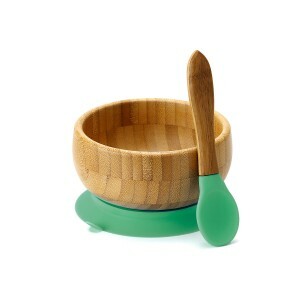 Around six months, solids should be gradually introduced because your baby will no longer be receiving enough iron from your breast milk or formula. You can continue to breastfeed in addition to feeding your child solids until they’re 12 months old – or longer if you wish. Give your baby a little breast milk or formula first to open their appetite. Start with half a teaspoonful of puree, and gradually increase to one or two teaspoons over the next few days. If your baby cries or refuses to eat, try again another time. You can start with baby rice cereal or any other mushy food (such as mashed avocado or banana). There’s no evidence that starting with sweet-tasting fruit will turn your baby off other foods. Watch your baby for cues that they’ve had enough, such as keeping their mouth closed or turning their head away from the spoon. Don’t force them to eat more because this could teach them to overeat. There’s isn’t any evidence that waiting to introduce foods such as peanuts, eggs, dairy or fish will prevent food allergies. If you have a family history of food allergies and you’re concerned, speak to your pediatrician. You can give your baby soft finger foods as soon as they can sit upright and bring their hands to their mouth. Good choices include pieces of banana, well-cooked veggies and soft pasta. You can start offering water in a sippy cup with meals. The AAP advises against giving babies juice before 12 months of age. 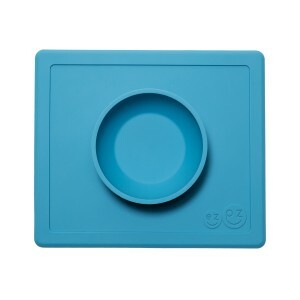 These amazing Tot-approved products will make feeding your baby a breeze! 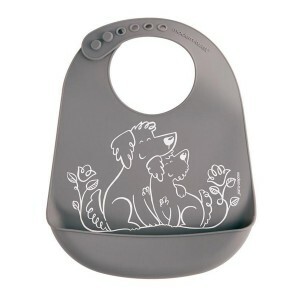 Modern Twist’s silicone bibs are non-toxic, easy to clean and available in a wide range of patterns and colors. 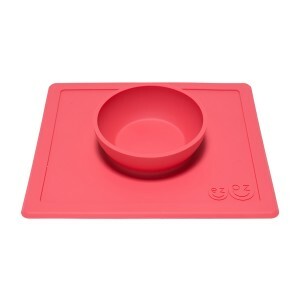 Made from 100% food-grade silicone, the Happy Bowl is a placemat and bowl in one that suctions right to the table and eliminates messes. Genius! Hello, gorgeous! 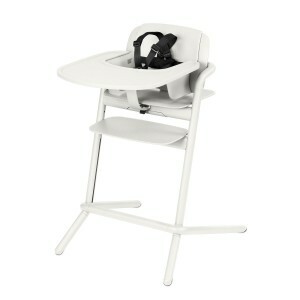 The Lemo is more than just a high chair that’ll look super-stylish in your kitchen. 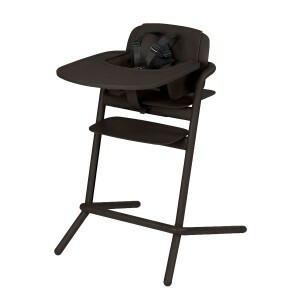 It’s a four-in-one seating system that will grow with your child for years to come. 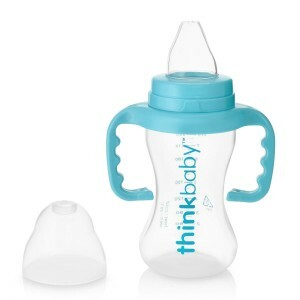 Thinkbaby’s award-winning Sippy Cup features an extra-soft, medical-grade silicone spout to ensure a smooth transition from bottle to sippy. 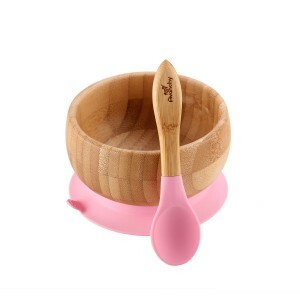 Your tiny tot will love eating yum-yums out of this beautiful bowl and spoon set made from biodegradable bamboo and food-grade silicone. 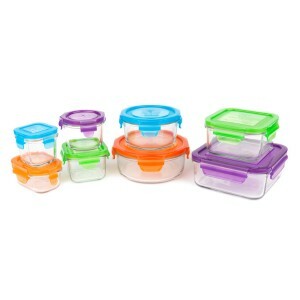 Store all those purees and squishy finger foods in Wean Green’s eight-piece container set made from 100% recycled glass. No nasty toxins! 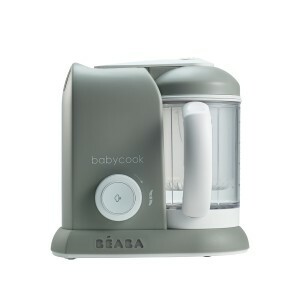 This incredible baby food steamer allows you to prepare and reheat fruits, vegetables, meat and fish for babies and toddlers in a matter of minutes. Goodbye, pots and pans! 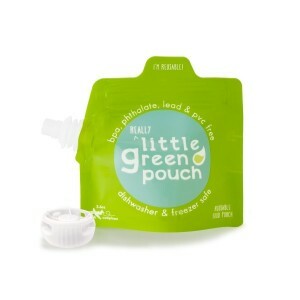 Fill these eco-friendly, non-toxic food pouches with everything from purees to yogurt for healthy snacks at home and on the go. Boon’s Drying Rack allows you to dry bottles, cups and feeding accessories quickly and easily. 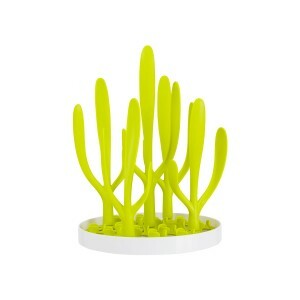 It saves space and looks great on your counter too! Don’t let the name fool you –Tidy Bottom Baby Wipes can also be used on food-smeared faces and hands when you’re out and about. They’re free from perfumes, parabens, dyes and other nasties.